What peachy pompoms! Have a wonderful holiday, and lets hope the Sun puts his hat on for you - far too much precipiatation at the mo'! Oh how sweet and cute! 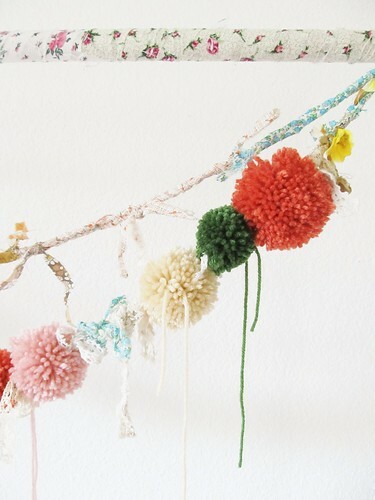 Pom Pom's are a VERY good thing! Smile. I hope you have a fantastic time in the UK and I hope you DO take a San Francisco road trip upon your return. Alas, I did NOT find Mollie Makes on my hunt yesterday, but I did find Handmade Living which is very cool! Safe travels! sounds like a wonderful time with family as well. Wow, you have such a wonderful summer of travel planned. Can't wait to see photos! Even better would be proof reading your book on the NYMR steam train from Pickering to Whitby. Pom poms - many a long year since I made some of those but, strangely, just a few weeks ago, at the bottom of one of my sewing bags, I found a couple of cardboard circles. Glad the 13 year old inherited the crafty gene. I was a member of the Tufty Club but sad to say over the passing years I have lost my Tufty badge. I am afraid I am not so keen on his facelift - his features seem to have coarsened with age and with that florid complexion and rotund cheeks he has an air of liking a snifter. I hope you have memorized your proofreading symbols and have a copy of Hart's Rules in your handbag - if I happen to see you on the train I will stop and help, for such is my stock in trade. Anyway, bon voyage and all that. Enjoy! Don't forget Mr Sun, you may need him. Oh! I truly love the colors you put together! Have fun with your pompoms! and i am thinking it perfectly suited to life on the road for a month. 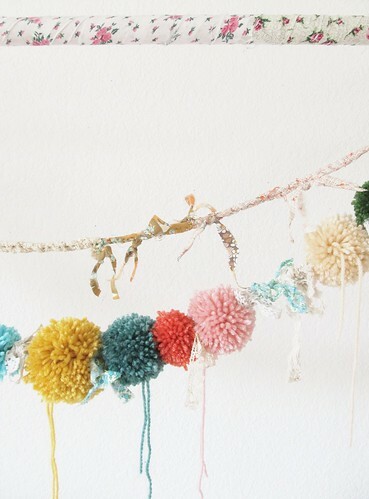 OMG, your pom pom garlands are way better than mine!!!! 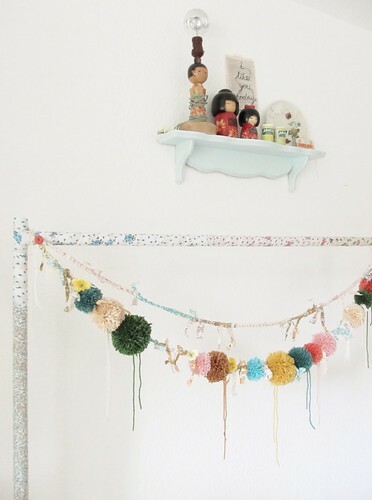 Even if I did use pom pom wrapping ribbon to finish them off, by hanging them on it. I am going to have another go. Did you get your clover pom pom maker? It is nice to have a little infulence in someone elses life!!!! You can get Wi-Fi in most places now, mc donalds, cafe nero, asdas cafe! So I wouldnt worry about not getting a connection! see good old blighty has caught up to the 21st century at long last, now maybe the weather could get a wiggle on and your stay would be perfect. You will love Amsterdam I am sure of that (altho its been a long time I've been there) and even meet some cyberfriends is so exciting. I did that once with some friends in Paris and we had so much fun. Have lots of fun and great experiences! The pom pom's are adorable and how sweet your 13 year old boy makes them with you! I could see mine doing something like that! And my heart would quicken to hear those words too! How grand! Enjoy your holiday!!! Will miss your posts! I love pompoms! Are the pompom makers a good investment? I've always just used a couple of bits of cardboard..
allie jane, yes only slight problemo i do not own a laptop or device which 'goes on the move' with me... perhaps it is me which needs to catch up with the 21st century! I am making myself some pom poms..these are darling and I am thrilled that your SON is having a fun time with it. I am hoping for the best of Summers for you. When you launch that book here in Seattle with a host of friends to support you!! Loving your little pom poms , i've not made one since i was at primary school. oh my, how exciting to be traveling the world pom poms in hand on trains, carriages, visiting far off places...hoping you have a delightful time this summer and come back to us full of tales and crafting and fun things to tell...best besties. For my summer vacation this year, I have a vision of myself traveling down Highway 1 in a 1960's mustang convertible, wearing sunglasses and a scarf and gloves. Somewhat like Audrey Hepburn. Give me the open road and new thrift shops to discover and explore......I'm a happy camper. I'm envious fer sure! Have fun and enjoy it. They grow up so fast. oooh i'm late to this leaving party! Tiff and Dottie if you have time to spare you are both most welcome to this little corner of devon - details by email. I was given a fantastically colourful pom pom scarf from a friend of mine at Christmas, who had got it from a shop called Accessorize.. I never stopped wearing it all winter! Have a lovely time here in the UK this summer, not that you'll be needing a scarf, for once it is actually a lovely warm temperature! 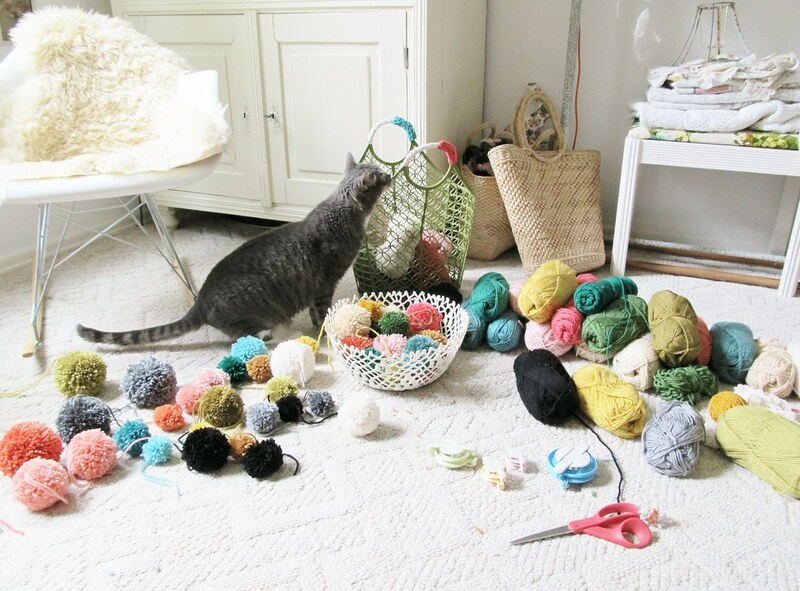 What size pom pom maker do you have? 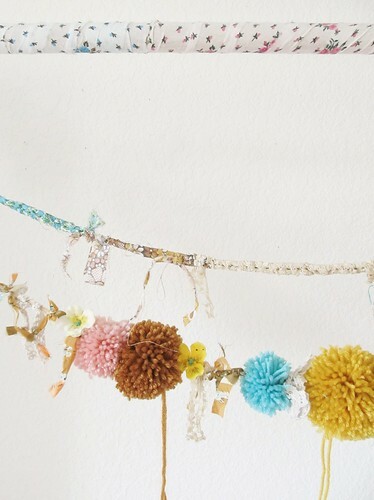 I love your garlands! I am really and truly going to quite miss your posts, Tif! I guess I'll just envy your traveling ways. I'm mostly kidding, but I really cannot wait to see what your book will turn out like. I bet it will be pretty darn terrific. Have a happy and safe trip Tif! And thank YOU for making this such a happy, shinshiney little corner of the internet to visit. I don't always comment but am often here, giggling at your words and marvelling at your craftiness. These pompoms are really cute. I hope you enjoy your time in the UK, and you should really have that road trip in San Francisco, it's such a great place I got to try my hands on this one, what a lovely idea, my daughter would love to have this hanging in her bedroom. Gosh, I miss you. Hope you're having fun. 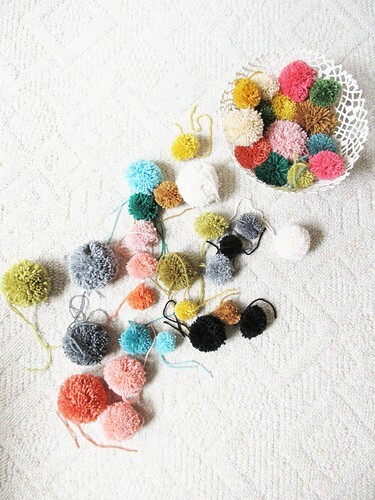 I thought of you just now when I saw a cute pompom idea from Lion: a pompom rug. The fact that a cute baby was sitting on it may have swayed me. 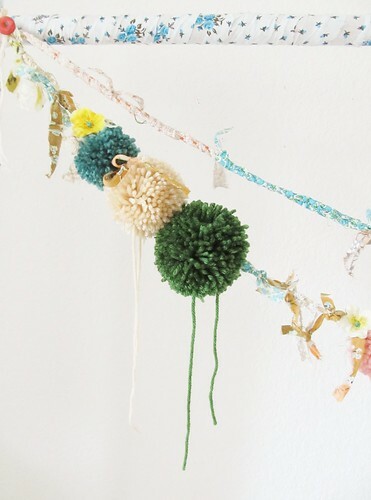 Are you still up for making pompoms, or tired of them by now? wow. I just found you. Where have you been all my life? O.k. that sounded creepy. Anyway, I was feeling unmotivated and bored, when I found your blog via Allsorts. Thank you for making me smile this evening. Can't wait to see what you're up to next. i used the pom pom maker which makes large and medium sizes and then one small one. if you go with clover make it is the blue and light green makers which will be the same size as mine. you have warmed my heart to say you miss me and i in turn have missed your lovely selves. you always put a smile on my face. 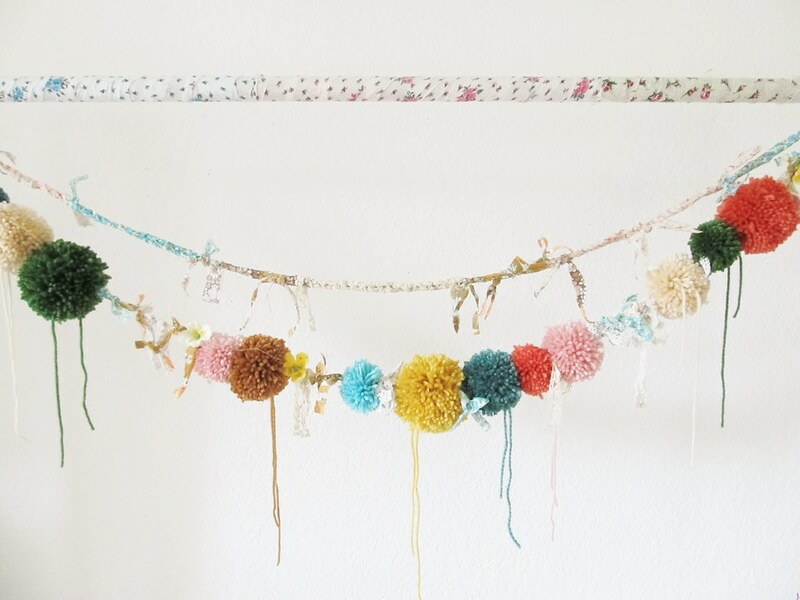 Love your version of the pom pom garland, so charming! I too am pom-pom smitten. We have discovered here at this abode that Madelinetosh makes awesome pom-poms because it's lighter in the middle and makes for a very cool effect! Continue on with your pom-pom loving! I'm inpired by these pompoms.